The new Bravo EDC is the newest addition to our standard Bravo Series. It is actually a scaled down version of the Bravo 1 and Gunny to a very compact EDC size. The handle scales have the same contours as the two larger models but with an overall slimmer profile to have the knife ride closer to the body when on the belt. It comes standard with the family look of the ramp, but we can remove the ramp if preferred. You will find this size to be easy to carry and very handy for small to medium chores. 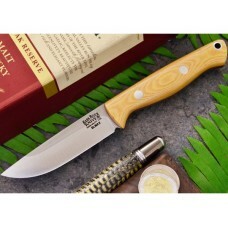 Bark River Bravo EDC Antique Ivory Micarta Red Liner Elmax Rampless. 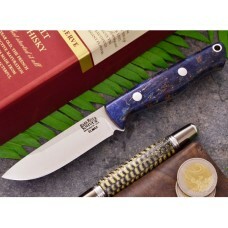 En mindre och smidigare versio..
Bark River Bravo EDC Blue and Gold Elder Burl Elmax Drop Point. 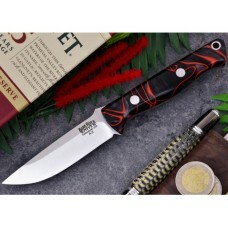 En mindre och smidigare version av ..
Bark River Bravo EDC Lava Flow Kirinite A2. 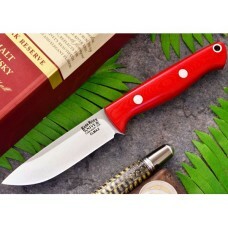 The new Bravo EDC is the newest addition to our standar..
Bark River Bravo EDC Red Linen Micarta Elmax Drop Point. En mindre och smidigare version av den kän..